Some Targeted Individuals (T.I.s) think they suffer from Carpal Tunnel Syndrome, Radial Tunnel Syndrome or Tennis Elbow - three conditions that normally are the result of repetitive injuries like typing or plumbing, or playing tennis or doing karate. Some even go so far as to have surgery to relieve the pain, weakness and numbness in their hands and arms, only to find the problem returns tenfold. If you are considering surgery, then a little bit of research will reveal that almost 30% of these surgeries result in no improvement at all, or even in a worsening of the condition. And if you are a Targeted Individual, consider the possibility that you will be in that 30%. Think long and hard before you go through the expense and suffering of surgery. Better yet, test to see if your symptoms are due to Electronic Harassment: the judicious targeting of a Directed Energy Weapon to specific points of the body. But how can you tell if you are a victim of Electronic Harassment or are experiencing a lifestyle medical condition? As with any non-T.I. sufferer, it begins with a TI awakening to pain, numbness and tingling in the fingers, hands, arms, elbows or shoulders, but here's the difference. Carpal Tunnel symptoms can be mimicked by weapons effects that target the inner side of the wrist, causing the tendon over the nerves to swell and pinch. There are three major nerve pathways along the shoulder and arm that are targeted to produce these results. Look at the above image. 1) Look at the lower arm in the above diagram. Do you see where the RADIAL NERVE comes closest to the surface of the skin at the outer bend (the back) of the elbow, and at the wrist closest to the base of thumb? Targeting those points, as well as any point along the nerves path which runs close to the survace of the outside of the arm, results in the numbing of, and tingling sensations in, the first three fingers, as well as in the weakening of those fingers' grips on objects. How can you tell if you are experiencing a Weapons Effects vs. a lifestyle activity Symptom? Gently rest the entire palm of your hand along the Radial Nerve's pathway. When you find a hot spot (the specific target site), cover it with shielding material. 2) But, what if your thumb, pointer, and middle fingers are just fine, and the problem is with the ring and pinky fingers? Then take a look at the upper arm in the diagram above. 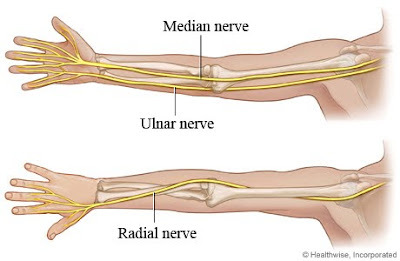 Targeting the ULNA NERVE where it comes closest to the skin, at the bottom of the front facing side of elbow, as well as at the wrist (closest to the pinky), and at the shoulder, all result in the numbing of, and tingling in the ring and pinky fingers. It also causes the grips in thos fingers to weaken. 3) When the MEDIAN NERVE is targeted sudden small flexing (jerking) of the finger joints can occur, as can finger pain. Take a look at the top arm in the above diagram. Learn this nerves' pathway so that you can locate the specific target site. 4) Does your elbow ache whenever you try to straighten your arm? The condition is commonly known as Tennis Elbow. Unfortunately, judicious targeting of the elbow's LATERAL EPICONDYLE (aka L.E.) will create a weapons effect that mimics tennis elbow. How is this possible? Take a close look at the diagram to the right. You can see that the L.E. lies atop the joint, closest to the surface of the arm. Targeting anywhere within the diagram's Area of Pain will cause the Weapons Effect that mimic's natural tennis elbow. CONFIRMATION - After you've found the confirming hot spots along your arm or hand you'll know where to shield. Next, you;'ll want cover or surround the effected arm with Rubbermaid rubber mat. Why this brand? Because the company owns its own rubber plantations as well as its the manufacturing plant in Malaysia. Other brands don't use enough rubber, but mix in too much vinyl and other plastics. The arm, from top of shoulder to fingertips, from front to back, must be encased, with the suction cups facing outward. There must be no gaps in the rubber coverage or the EH will get through and still do harm. One hopes this advise is heeded and helps, and that A Word to the Wise (T.I.) will be sufficient.